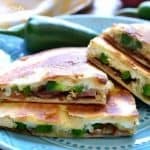 Jalapeno Popper Quesadillas have ALL the flavors of jalapeño poppers in a fun package that's perfect for dipping! These little bites make a delicious summer appetizer and can also double as a meal! Prepare quesadillas by spreading one tortilla with cream cheese; top with jalapeños, shredded cheese, cooked bacon, and panko bread crumbs. Place other tortilla on top. Heat 1/2 Tbsp. olive oil in a large frying pan. Cook tortilla over medium heat until golden brown on one side. Add remaining oil and flip; cook until both sides are golden brown. Serve as is or with sour cream & salsa.